The Heliospheric Imagers (HIs) aboard the NASA’s Solar TErrestrial RElations Observatory (STEREO) have been successfully operating since its launch in 2006. The STEREO/HI instruments were developed by a UK-led international consortium. With the STEREO/HIs, interplanetary coronal mass ejections (CMEs) are continuously tracked in white-light imaging, and coronagraphic remote-sensing observations within 30 solar radii are causally linked to in-situ measurements at 1 AU. What the HIs observe at viewing elongations are brightness patterns of CMEs. However, how to infer spatial positions from brightness patterns suffer large ambiguities. The empirical geometry models of CMEs have to be used in analyzing the STEREO/HI data. Aiming at understanding observable white-light signatures of interplanetary CMEs, Drs. XIONG Ming, FENG Xueshang, and LIU Ying from the State Key Laboratory of Space Weather, National Space Science Center (NSSC), China are extensively collaborating with Drs. Jackie Davies, Mathew Owens, Richard Harrison, and Chris Davis from the British STEREO/HI team. 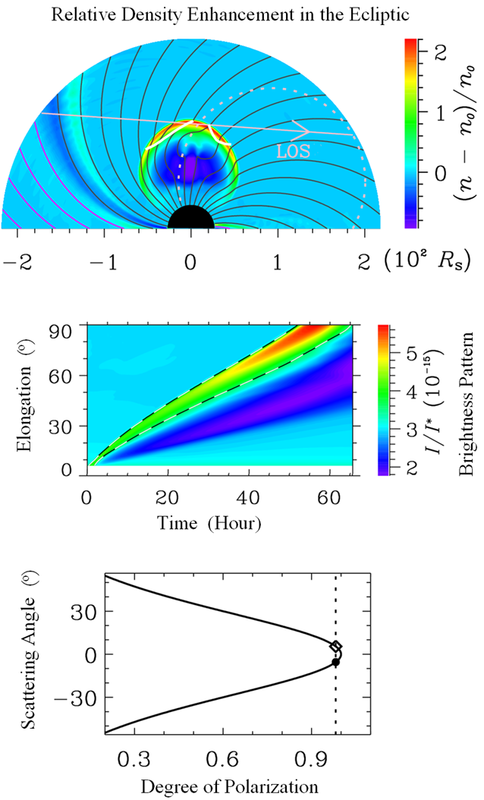 The Sino-British scientists construct a numerical magnetohydrodynamic (MHD) model of the inner heliosphere, synthesize white-light images of CMEs according to a Thomson-scattering principle, and establish the causal links between CME dynamics and observable white-light signatures. Their new findings show that (1) the brightness patterns of interplanetary CMEs significantly depend on viewing perspectives, and the geometry effect of Thomson scattering process is increasingly significant at large elongations; (2) the spatial positions of CMEs can be reliably inferred from the brightness patterns, with additionally coordinated measurements of polarization degree in white light and Faraday rotation in low-frequency radio. These scientific findings merit two academic papers, published by Astrophysical Journal and Solar Physics respectively. This Sino-British cooperation combines forward modeling from numerical MHD simulation and backward inversion from realistic STEREO/HI data. Such an effort is very helpful for understanding the morphological, kinematical, and dynamical properties of interplanetary CMEs, as observed by the STEREO/HIs. Particularly, “This forward MHD modeling is very meaningful in exploiting STEREO/HI data.” says the British STEREO/HI team.